Vice-Chancellor of City University London, Professor Sir Paul Curran, the Dean of Cass Business School, Professor Marianne W Lewis and Regional Director and Head of The Dubai Centre Mr Ehsan Razavizadeh were all in attendance as a record number of students graduated from City University London. 55 Executive MBA students received their certificates. The ceremony at DIFC’s Conference Centre hosted over 200 people including families, business leaders and distinguished guests His Excellency Essa Kazim, Governor of DIFC, His Excellency Mohammed Hussein Al Shaali, the former minister of State for Foreign Affairs, and Her Majesty’s Consul General, Mr Paul Fox. 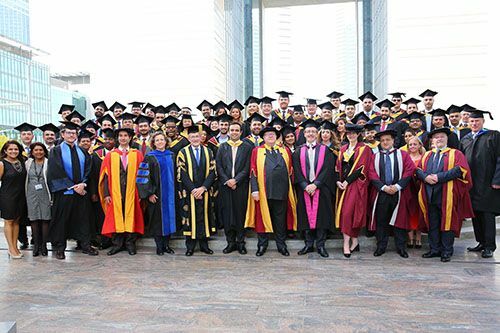 Ehsan Razavizadeh, Regional Director, MENA and Head of The Dubai Centre said: “We are delighted to celebrate Cass Business School’s seventh EMBA graduation in Dubai. The Executive MBA is delivered by leading academic staff from City’s London campus, in a monthly block weekend format to accommodate the needs of working professional students.